The Yankees and Dodgers have met more times in the World Series than any other pairing in postseason history.1 This World Series rivalry is punctuated by moments that have become as much a part of baseball history as the games themselves. When the New York Yankees faced the Los Angeles Dodgers in the 1978 fall classic,3 it was the 10th time they had met dating back to 1941, when the Dodgers played in Brooklyn. When the teams returned to Yankee Stadium for Game Three, the Yankees were in the unenviable position of having lost the first two games at Dodger Stadium. The outcome of Game Two was going to be determined in the ninth inning with the Dodgers leading 4-3. Ron Cey had accounted for all the Dodgers’ runs on a fourth-inning RBI single and a sixth-inning three-run homer. Reggie Jackson had done the same for the Yankees with a two-out double in the third inning and an RBI infield out in the seventh. With two on and one out in the ninth, Dodgers manager Tommy Lasorda called on rookie Bob Welch5 to face Thurman Munson who flied out to right for the second out. Then came another one of those epic moments in this rivalry, Welch pitching to Jackson. The instructions were clear. “I was told to throw strikes, to make them hit my pitch,” reported Welch, “so I threw only fastballs.”6 Nine fastballs and a swinging strike three on a full count. The Dodgers led two games to none and the teams headed to Yankee Stadium. The Yankees struck first with single runs in the first and second innings for a 2-0 lead. Roy White homered down the right-field line in the first and Bucky Dent's one-out groundout in the second scored Nettles, who had singled earlier in the inning. The Dodgers got one run back in the third when Bill Russell singled to score Bill North, who had walked, stolen second, and advanced to third on a groundout. It could have been worse had it not been for Nettles’ wizardry. Reggie Smith hit a rocket down the third-base line. Nettles dived to his right to snag it, hurried to his feet, and threw Smith out at first to end the inning. The Yankees got to Don Sutton decisively in the seventh inning with three more hits. An RBI single by Thurman Munson scored Bucky Dent from third and brought in reliever Lance Rautzhan, who yielded another RBI single to Reggie Jackson, scoring White. Lou Piniella's groundout scored Munson to finish the game’s scoring, 5-1. For Guidry, it had been a struggle not being able to retire the Dodgers in order in any inning. “When I was warming up before the game, I thought I had a good fastball. I must have left it in the bullpen,” he said.11 But his 137-pitch gutsy performance meant the Dodgers’ World Series lead had been cut in half, two games to one. Game Four was an extra-inning thriller, but not without controversy. The controversy involved Reggie Jackson as a baserunner in a sixth inning that started with the Dodgers leading 3-0. Jackson had singled to right field to drive in a run. When shortstop Bill Russell stepped on second after fielding Lou Piniella’s grounder, he attempted to throw to first for an inning-ending double play. Did Jackson intentionally interfere with the thrown ball when it hit his hip and bounced away from first baseman Steve Garvey?12 No interference was the umpiring crew’s call and Thurman Munson scored on the errant throw, cutting the Dodgers lead to 3-2.13 In the bottom of the 10th inning, Lou Piniella hit a Bob Welch fastball to right-center, scoring Roy White for a 4-3 Yankee victory and a tied World Series after four games. The rest of the World Series was dominated by the Yankees, Game Five at Yankee Stadium and Game Six at Dodger Stadium. The Yankees outscored the Dodgers 19-4 in those two games to secure the 1978 title. Thanks to the generosity of a friend, my father and I found ourselves behind the Dodgers’ dugout on the third-base side of Yankee Stadium, both of us attending our very first World Series game. Of course, memories returned of Octobers in 1952, 1953, 1955, and 1956 when the Brooklyn Dodgers played the New York Yankees in the fall classic. For me, sneaking a small transistor radio into elementary school or watching a weekend game on a 12-inch black-and-white television was in order. The moment of unbounded joy came in Game Seven of the 1955 World Series with two outs in the bottom of the ninth inning: Elston Howard grounds to Dodgers shortstop Pee Wee Reese who throws to first baseman Gil Hodges and Johnny Podres’ 2-0 shutout of the Yankees seals the first and only World Series title for the Brooklyn Dodgers. The author accessed Baseball-Reference.com for box scores/play-by-play information (baseball-reference.com/boxes/NYA/NYA197810130.shtml) and other data, as well as Retrosheet.org (retrosheet.org/boxesetc/1978/B10130NYA1978.htm). 1 In 1981, the Dodgers and Yankees met for the 11th time in World Series history. Through the 2017 season, the Yankees and Giants have met seven times in the World Series and the Yankees and Cardinals have met five times. 2 Cliff Corcoran, “Fall Classics: The 11 World Series Showdowns Between the Yankees and Dodgers,” Sports Illustrated (SI.com), June 18, 2013, accessed November 25, 2017, si.com/mlb/strike-zone/2013/06/18/fall-classics-the-11-world-series-showdowns-between-the-yankees-and-dodgers. 4 Lowell Reidenbaugh, “Dodgers’ Homer Barrage Sinks Surprised Yankees,” The Sporting News, October 28, 1978: 6. 5 The 21-year-old Welch made his major-league debut with the Dodgers on June 20, 1978, in a relief appearance against the Houston Astros. Welch finished the season with record of 7-4, 2.02 ERA in a versatile role as a starting and relief pitcher. For example, his record included three complete-game shutouts and three saves in 111⅓ innings. 6 Lowell Reidenbaugh, “In Heat of the 9th, Young Pro Welch Rescues Dodgers,” The Sporting News, October 28, 1978: 8. 7 Ron Guidry was an American League All-Star selection in 1978 and after the season, he won the AL Cy Young Award and finished second in the AL MVP balloting to Jim Rice. 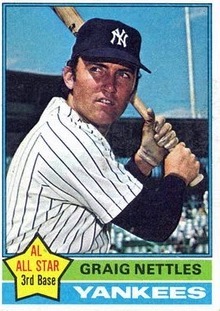 8 Graig Nettles was traded by the Twins to the Cleveland Indians in 1969. He became a Yankee on November 27, 1972, when the Indians traded Nettles and Jerry Moses to the Yankees for John Ellis, Jerry Kenney, Charlie Spikes, and Rusty Torres. 9 Joseph Wancho, “Graig Nettles,” SABR Baseball Biography Project, org/bioproj/person/516e763c. 10 “Nettles’ game-saving play,” MLB.com, accessed December 3, 2017, mlb.com/video/nettles-game-saving-play/c-20521781. 11 Lowell Reidenbaugh, “Acrobat Nettles Derails Dodger Express,” The Sporting News, October 28, 1978: 9. 12 “World Series Game 4: Run Scores After Throw Deflects Off Jackson,” YouTube, accessed December 5, 2017, youtube.com/watch?v=tvWKWvrVfrI. 13 Lowell Reidenbaugh, “Reggie Stirs a New Storm, Piniella Raps Decisive Hit,” The Sporting News, October 28, 1978: 10. 14 Lowell Reidenbaugh, “Acrobat Nettles Derails Dodger Express,” 16.